Directed by Marc Evans (Snow Cake, My Little Eye), Patagonia stars Matthew Rhys (Edge of Love, Brothers and Sisters) and Nia Roberts (Solomon and Gaenor) alongside Grammy Award winning singer Duffy, in her acting debut. A road movie for romantics, Patagonia is a film of intimate moments that play out against the sweeping panoramic landscapes, complemented by a hauntingly beautiful soundtrack. We've not managed to catch up with this one yet, but David Parkinson in Empire described it as "a tender, quietly funny film about the power of the past and the possibilities of forgiveness," while at Little White Lies Adam Woodward called it "a loudhailer that announces the Carmarthen son as one of British cinema's most promising talents." Here's hoping. 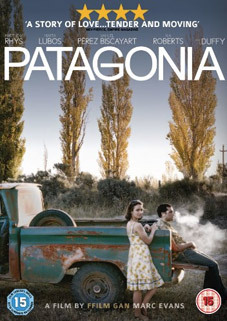 Patagonia will be released on UK DVD and Blu-ray by Verve Pictures on 11th July 2011 at the RRP of £15.99 for the DVD and £19.99 for the Blu-ray. The only listed special feature on either is a making-of documentary of indeterminate length.